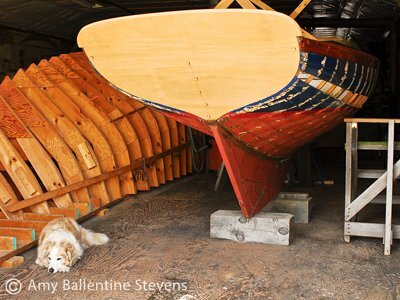 Ballentine's Boat Shop (BBS), established in 1974, is tucked away in Cataumet, Massachusetts. We front not a harbor or bay, but a cranberry bog. BBS has grown, at this same location, from a one-man shop with one small building to a facility with 5 large efficient buildings and a 10 to 13 person staff skilled in woodworking, yacht finishing, rigging, and bronze fabrication. 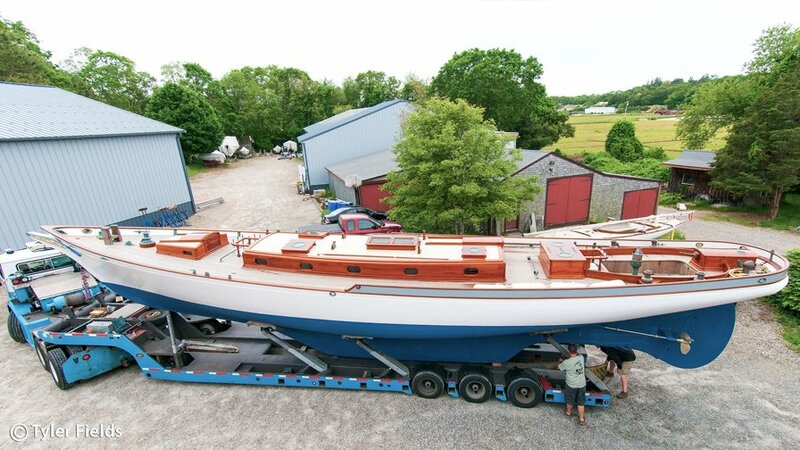 Ballentine's now stores and fully maintains boats ranging from Herreshoff 12 1/2 footers to a 46-foot Power Cruiser. 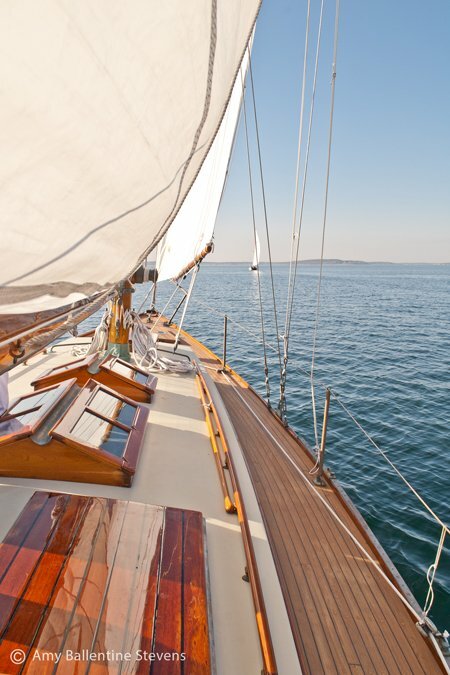 Our emphasis has always been to provide quality service, maintenance and restoration of vintage wooden yachts. The Ballentine's crew is meticulous in their carpentry and finish work. We have restored and continue to maintain an impressive and varied fleet. Ariel II - She is For Sale! BBS is probably best known for restoring and maintaining the original Herreshoff 12 1/2 footers. Because we service so many of this design, we also fabricate their hardware. It is suitable for use on the wooden Herreshoff 12s, Havens, Somes Sound as well as the fiberglass replica, the Doughdish. Our high quality Bronze Hardware is available for purchase. In addition to maintenance and restorations we also build new classic boats. The Herreshoff Buzzards Bay 25 is built in traditional plank on frame construction. We also finish the fiberglass replica of the Herreshoff 12 1/2, the Doughdish, and the Stuart Knockabout, an L. Francis Herreshoff 28-foot daysailer. BBS built a 33-foot Herreshoff Buzzards Bay 25 (FLYING DREAM) of traditional plank on frame construction (oak and locust framework, cedar planking, copper rivets, and bronze fastenings) to exacting standards. We built the spars and fabricated the hardware, all to original specifications. Ballentine's has the hull and hardware molds to duplicate or modify this boat on request. She was on the cover of WoodenBoat magazine May/June 2003. For more information on her construction see our Buzzards Bay 25 page. She was also Miss December in the BBS Calendar Girls. The Only Fiberglass Herreshoff 12 1/2 for H Class Racing! For more information please visit our Doughdish Web site to see what goes into the construction of a New DOUGHDISH. 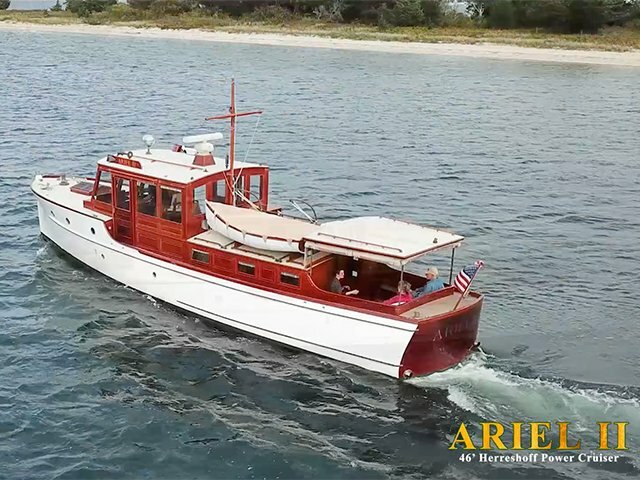 This 28' fiberglass boat is a descendant in a long line of great Herreshoff creations. In this case, L. Francis succeeded admirably in utilizing all his earlier experience and familiarity with his father's great designs, advancing them with his own independent genius and artistry. What evolved is his own pure creation, and an exceptional daysailer. In building each Stuart Knockabout, we have endeavored to preserve the essence of the original wooden boat and advance the comfort and sailing performance in a more forgiving and easier to maintain version. The foam cored fiberglass hull construction is also lighter and permits the addition of 400 pounds of keel ballast, bringing the completed boat to her designed displacement, thereby increasing her capability to carry sail into a good breeze. For more information please visit our SK Web site to see what goes into the construction of a New STUART KNOCKABOUT or view our slideshow on the new construction of SKATE: SK No.80 on this Web site. Ballentine's also has a line of classic lapstrake tenders: Doug Hylan's PeaPod and 16-foot Garvey Skiff, and Joel White's Shellback and Nutshell. 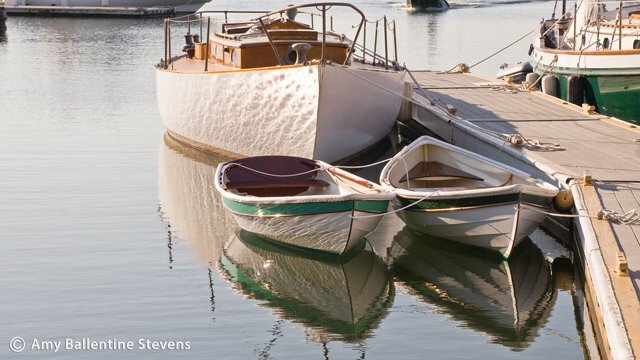 The 13' Beach Pea Pod, designed by Doug Hylan, is a lapstrake double ender specially designed for rowing, towing and sailing. It easily pulls up on the beach for landing parties, and with the additional length it can accommodate a little more crew or cargo. The Garvey is our new work boat! She is the Ben Garvey Skiff made of Sapele plywood with bronze hardware and mahogany floor boards. She has a strong and well padded rail to easily move the boats we take care of while keeping all our hard work safe. She is sturdy, quite buoyant (especially compared to our water logged old whaler), and not to mention, she is a looker! If anyone wants to try her out, let us know, otherwise keep your eye out in the harbor for the prettiest yard skiff around. The 11'2 Shellback, a Joel White design, is a stable dinghy that can be effectively rowed, sailed or towed. The 9'6 Nutshell Pram, designed by Joel White, is related to the Shellback but it is shorter and without a pointed bow. Like the other two dinghies, it rows, sails and tows quite well, while offering stability in a more compact package. CALABAN was built according to the original plans for ARIEL II obtained from MIT. This tender was built to exacting specifications and is a sailing, as well as rowing dinghy. Sidney Herreshoff's design, despite having never been built and tested (to our knowledge), is amazingly effectual and beautiful. We are a full service yard meticulously maintaining and caring for boats ranging from 16ft to 58ft. 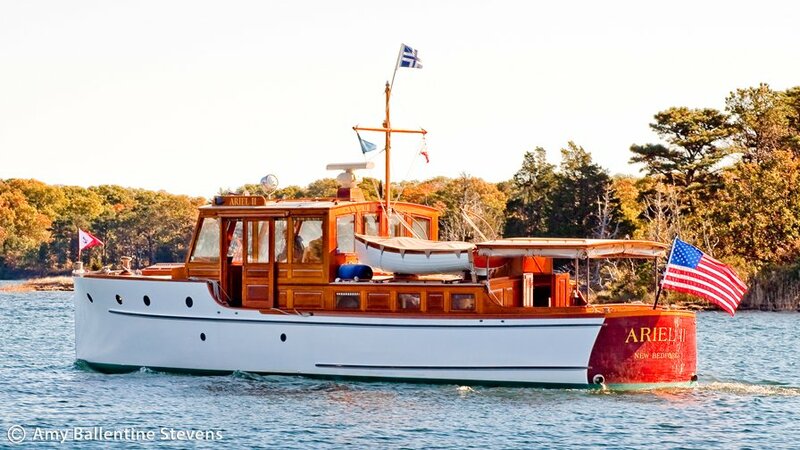 We upgrade and refine both wooden and fiberglass yachts to mint condition and classic aesthetics. Come for a visit and tour to see our facilities and exceptional fleet. Winter is the best time as the fleet is here, and you can't be out on the water anyway. Feel free to call or email to arrange a visit. 508-563-2800 or email.